Just as every company needs a memorable and eloquent logo, each high school needs a sign that shows its face to students, parents and the community at large. A high school is more than a place of learning – it's also a center for sports activities, community events, cultural happenings, elections and many more aspects of community life. A high school sign can speak to all of these roles by being more than just a name-plaque. Kerley Signs can create a sign that incorporates a dynamic signboard or electronic display, so that your school can show local team sports scores, advertise school events and news, congratulate accomplished students and teachers, recognize and promote local people, places and events, and much more. There are many options to choose from – we offer programmable electronic LED signs of various sizes that can be integrated into a monument-style front sign or stand on their own, as well as single-line marquees, message centers and more basic message-board signs with changeable letters. Naturally, we also offer reasonably-priced static signs in a staggering variety of shapes, styles, sizes and materials. Finally, for all our customers, Kerley Signs provides sign installation services at high schools in all 50 states. We will make sure that everything is set up and connected correctly and with exacting diligence. 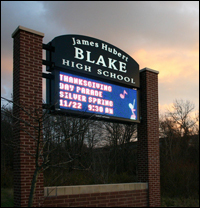 No matter your high school's needs and budget, you will be satisfied by our school sign products and service alike.